. يعرف Ascott International بالمستوى الراقي لخدماته ولباقة موظفيه، وهذا ما ستجده في سيتادين أون بورك ميلبورن . يقدم الفندق فرصة للاستمتاع بشريحة واسعة من الخدمات بما فيها: واي فاي مجاني في جميع الغرف, مكتب الاستقبال على مدار الساعة, مرافق مخصصة لذوي الاحتياجات الخاصة, تخزين الأمتعة, واي فاي في المناطق العامة . في سيتادين أون بورك ميلبورن غرف نوم يزيد عددها عن 380 صممت بذوق وعناية لتوفر لك كل وسائل الراحة . بعضها يحتوي أضاً على تلفزيون بشاشة مسطحة, اتصال لاسلكي بشبكة الإنترنت (مجاني), غرف لغير المدخنين, مكيف هواء, تدفئة. كما أن مجموعة الخدمات الواسعة الموجودة في الفندق لضمان راحتك تترك لك الكثير من الخيارات لقضاء وقتك أثناء فترة إقامتك. إن سيتادين أون بورك ميلبورن هو خيارك لخدمة الفنادق الراقية في ملبورن. يرجى العلم أن الشقة يتم تنظيفها يوميًا باستثناء أيام الأحد والعطلات الرسمية. يُفرَض رسم إضافي على معاملات بطاقات ائتمان أمريكان إكسبرس وداينرز كلوب بنسبة 2,20%. يُطبق على معاملات البطاقتين الائتمانيتين ماستر كارد وفيزا رسم إضافي نسبته 1,00%. The hotel was in a great location a block away from the busy shopping area and another 2 blocks from Federation sq where there is a footbridge which takes you over to Southbank. By default there is no room service on Sunday but you can request replacement towels if needed. Felt pool area wasn't too clean, very slippery around the area and also in the pool floor. Room is big and clean, equipped with all the necessary amenities. Bed is really big and comfortable, the hotel staff is very helpful with enquiries and the location is fantastic, close to a lot of eateries and shopping areas and next street to Chinatown. Will def stay in this hotel next visit. Used Uber to/from Melbourne Airport to Citadines. Nearby resturants and fastfood (McD and Hungry Jacks). Went to nearby Thai massage which was excellent before our flight next day to Sydney after touring the CBD. Free tram zone made getting around the CBD easy. Facilities clean and quiet, Would stay here again if we get a change to visit Melbourne again. First and foremost, the location is very good. There is a free tram stop almost in front of the hotel which will be able to link to the rest of the city. The staff, efficient and very courteous. The rooms were well designed, very comfortable plus it has all the facilities for self-catering. Thank you Citadines for making it a memorable visit. The hotel was really central, and parking was affordable for each day, only $20.00. We were able to walk everywhere we needed to be, and within very close walking distance to a tram stop. 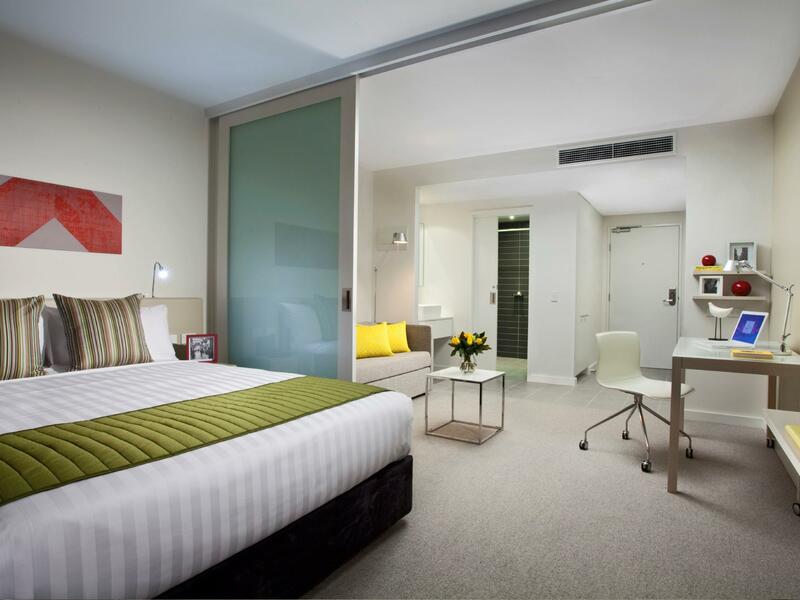 We had a very enjoyable experience and enjoyed staying at the Citadines on Bourke. Large room, comfy bed, good location, but the staff, or at least those I dealt with, need considerable improvement. The Filipino girl that checked me in didn't smile or welcome me to the hotel and when I asked for an ice bucket the bellboy brought a bucket with no ice in it. Doubt I would stay again as there are plenty of other options nearby. I’ve made two reservations for my colleagues who were there for 2 days meeting at Melbourne. They like the location as it is very convenient to their meetings location, by walking! Staff are helpful too! Good job guys! Free cribs available. The room is quite spacious. Laundrette at 10th floor..it is FOC and they do provide laundry detergent but must get from reception. Wheel accessible but there's slope to access to the lobby. Room cleaning is provided everyday. Friendly and helpful staff. Nice hotel in a very superb location. Many restaurants around and convinience store. Tram in in front of the hotel. Stayed here last year, satisfied with the service and all. That is why stay here again this year. What I complain with this stay is when the housekeeping did not make up my room for 1 day. I got back at 9.30 pm found my room has not been claeaned, complained to receptionist down stairs and they happily change the dirty towels and offered the room to be change but my kids already tired and wants to go to sleep. They make up the room the next day as usual. Other than this mishaps, I am satisfied with the hotel. Stayed in a Studio Executive with kitchenette facilities. Room big enough for 2 Adults and a 3YO. Hotel in an excellent location. Near to Chinatown and Melbourne Central. Tram is directly outside the hotel. A lot of eateries near the hotel. This was our second stay at the Citadines. We were in a 2 bedroom apartment on the 24th floor and had a really nice view of the city. Location is excellent as usual with a tram stop almost right outside. Many good restaurants and eateries within walking distance. Shopping is also down the street and basically stretches for several blocks. Staff was helpful and efficient and made our stay very pleasant. The rooms and beds were comfortable. The lounge and dining area in the apartment gave it a nice spacious atmosphere. 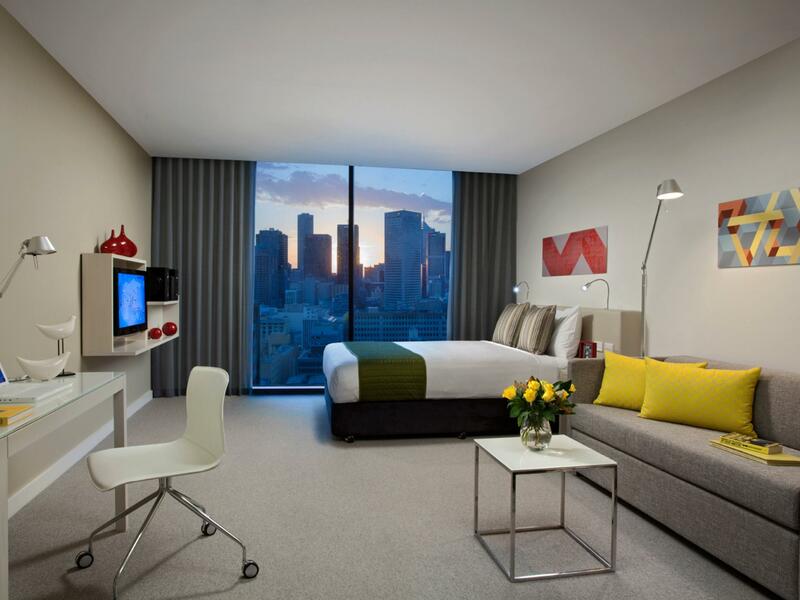 All in all a great place to stay when in Melbourne. The staff in the reception was smiling and very friendly. and effective at the same time. The room was very clean and pleasant. The tramp stop 7 is just in front of the hotel but everthing in the center of Melbourne is in walking distance. I will return to this perfect high class hotel. Staffs were helpful and friendly. We had a spacious room on the 24th floor with a full wall window looking out to the bay. All possible amenities were available. 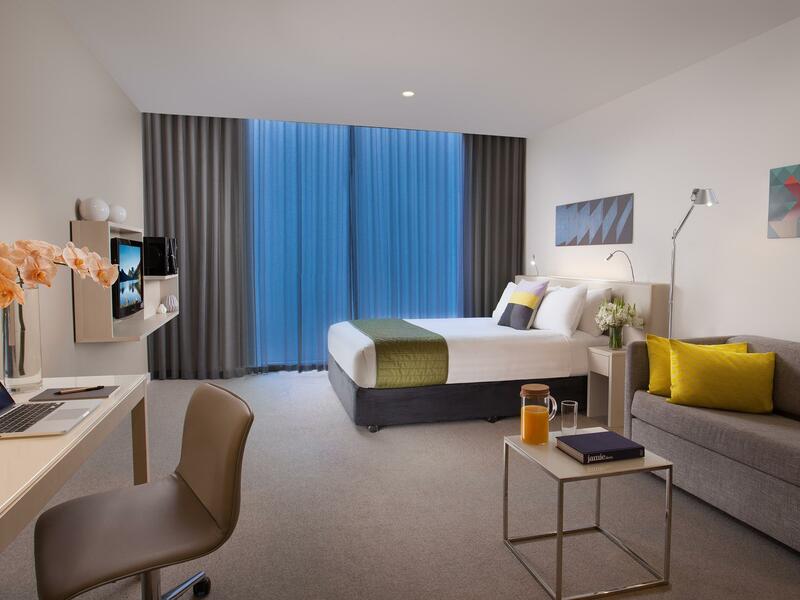 This hotel was very central, a good walk to the Victoria Markets, close to the theatres, restaurants, Melbournes interesting lanes, shopping and Melbournes Circular routed free tram. 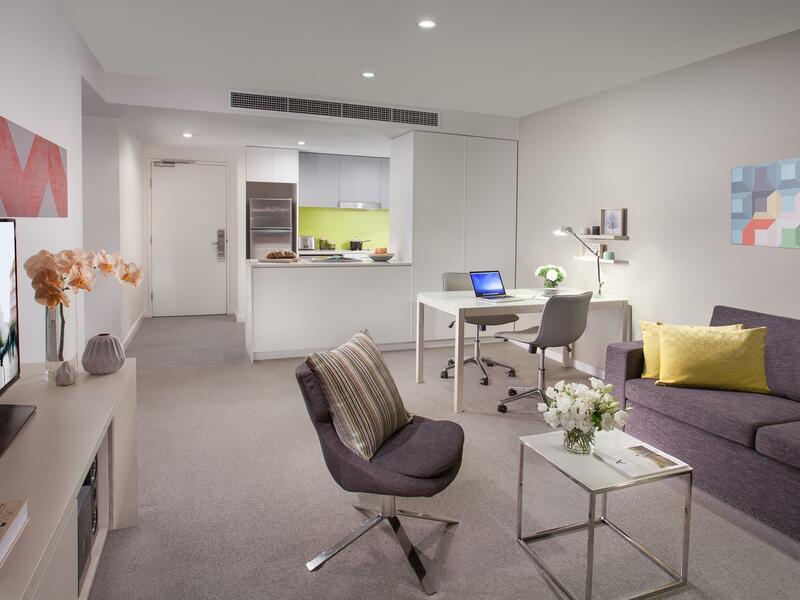 We love the Citadines group of hotels and have had similar experiences in Hong Kong Ashley Rd. Good location to shopping streets; tour pickup stands; halal nandos opposite hotel; clean room; ensuite bathroom & one shared bathroom outside for 2-bedroom apartment; kitchenette well-equipped; staff allowed us early check-in as room was ready when we arrived early in the morning. Awesome! 2nd Citadines visit after Paris. 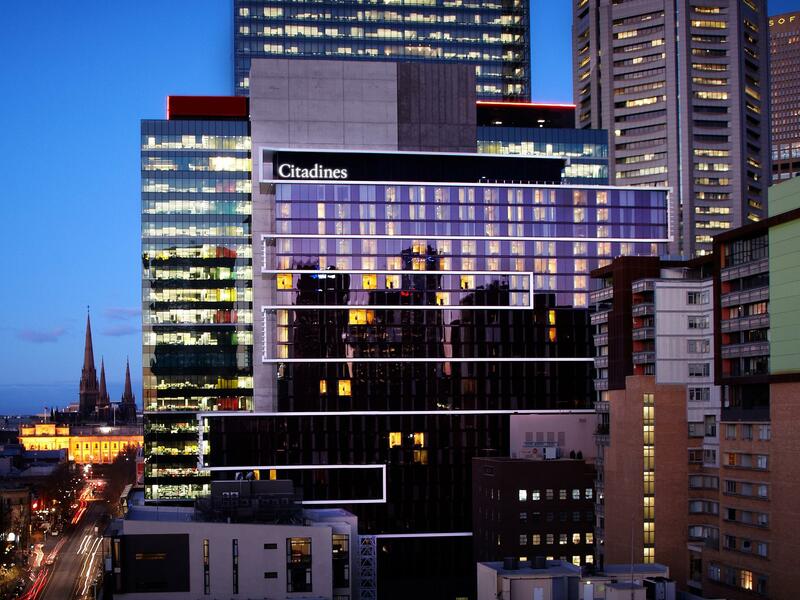 Booked Citadines on Bourke Melbourne on 19-23 August. Check in was a breeze, got the room at 10am. Booked a 1 bedroom apartment for my family of 3. Daughter took the sofabed. Location was great. Tram stop just outside the hotel. Food aplenty within walking distance. Tang Food Emporium just 5 minutes walk. 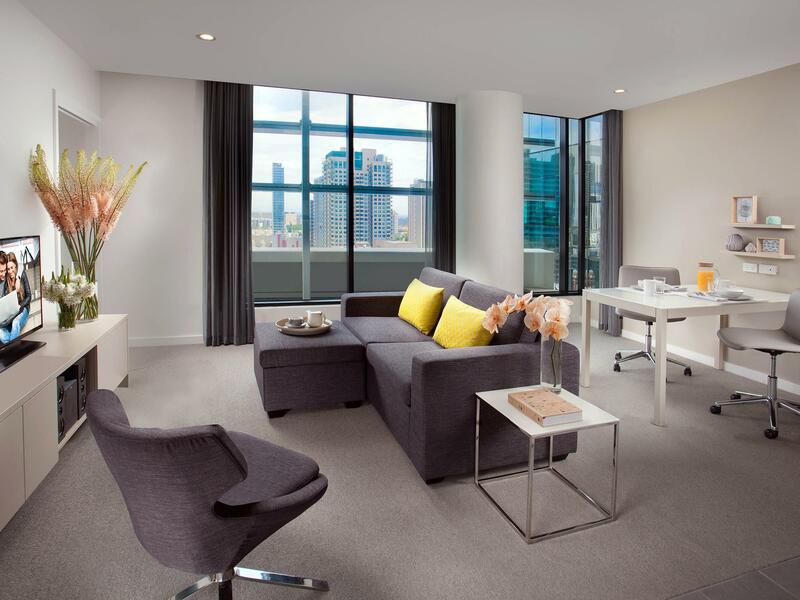 10 minutes walk to Federation Square, Melbourne Central & major shopping area. Staff very helpful & friendly. Will definitely choose Citadines again.